Please join us in congratulating Sean on his Junior Black Belt. The junior black belt test is a private test between the student and the instructors and the events that occur at the test remain between the attendees. Sean performed in a distinctive manner all the skills and knowledge needed to receive the rank of Junior Black Belt. Sean is a talented, young individual with a certain eagerness to learn. His passion to try each and every thing is inspiring to all who meet him. His journey to Adult Black belt, but as he will tell you, he will never stop reaching for that goal. This article was posted in Promotion. Bookmark the permalink. Follow comments with the RSS feed for this post.Post a Comment or leave a trackback: Trackback URL. 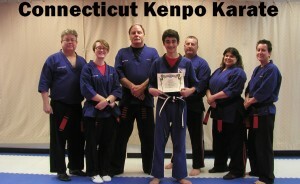 « CT Kenpo Karate is Moving!